The curtains are drawn! Are you ready? 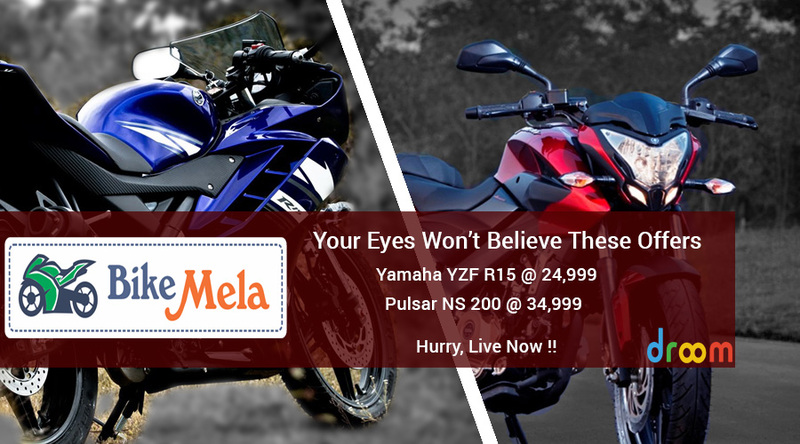 Yes, the Biggest Bike Mela ever is now open for all and is heating up the online market unlike anything done before. Let your fingers do some walking at droom.in to find out the most popular bikes with lowest price tags in India. Droom has put over 100 bikes on sale under the banner of India’s Biggest Bike Mela offering best prices on motorcycles in India. You can save up to an unbelievable 70% on motorcycles and that’bs not a joke. The bike mela will be featuring new deals every 3 hours that are covered with 100% Droom Buyer Protection. On top of big discounts, you get motorcycles or scooters from a verified and a trusted seller. You won’t see prices this low ever again in near future. You have to hurry up as these deals are valid for today only i.e June 30, 2015 till 10:00 p.m.
From standard motorcycles to superbikes to anything in between, you can shop a motorcycle that fits every budget and need. Get hot deals on Bajaj Pulsar, Bajaj Platina, Hero Passion Plus, Yahama FZ, Honda Activa, Suzuki Hayate, Royal Enfield, and more. The company has brought the prices for these high tickets items to extremely economical for almost anyone. You can simply select the bike and make use of Droom coupon code mentioned with the product to pocket the discount. You can shop this bike mela at droom.in only. Change the way you commute with your new vechicle from Droom. Droom is India’s first marketplace to buy and sell automobiles, and the only transactional platform where you can shop a car, motorcycle, scooter, cycle or more in a few clicks. Hurry up guys as these deals are selling like hot cakes and won’t last that long. So, what’s stopping you? Just get, set and shop! Click here to check the Best Offers.